I was using jotform on my blog, www.gaytravelinformation.com. Someone "spammed" me the other day and kept submitting requests via jotform (dozens and dozens of them) which has disabled my account. I would still like to utalize jotform on my web site. Can you please fix this problem for me and/or tell me what I need to do? Currently the link on my blog is broken. prevent Spam submissions from happening in the future. 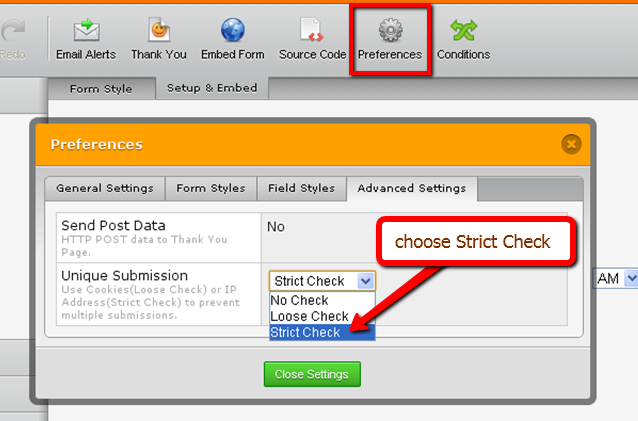 Advanced Settings tab to prevent multiple submissions from a particular IP address. For the meantime I have reset your limits to enable submissions on your forms.